Ideally situated along I-90 between the Nagel Road and State Route 83 interchanges, the Chester Road corridor is booming with development activity. Premier outdoor retailer Cabela’s has announced its only Northeast Ohio location here, to open in August 2016. Menard’s will be opening in early 2017. 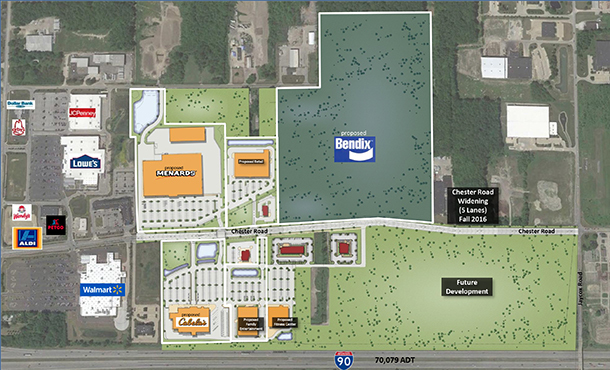 Additionally, Bendix Commercial Vehicle Systems has recently announced plans to relocate its world headquarters here. Future plans call for retail, restaurants, entertainment and corporate offices. Multiple parcels up to 60 acres, which can be subdivided as necessary. Avon is an affluent suburb located 30 miles west of downtown Cleveland. Per U.S. census data, it has about 90,288 residents and a median household income of $98,848 versus Ohio’s median household income of $48,000. The nearby section of I-90 experiences average daily traffic of 70,079.